Die erst unlängst erstellte Transkription der 2. Sinfonie durch den jungen finnischen Pianisten Henri Sigfridsson darf man getrost als den Liszt'schen Übertragungen ebenbürtig bezeichnen. (...) Sigfridsson bewegtdie riesigen Klangmassen (...) mit staunenswerter Souveränitätund lässt zeitweise sogar die Originalversion vergessen. Mehr ist für einen Pianisten wohl gar nicht möglich. If you are a fan of Sibelius (...) then this is a must-have recording which will only enhance your appreciation of the great composer's genius. (...) All in all, I have to say this is a magnificent success, which was by no means my assumption in advance. Sigfridssonin soitossa on sinfonista kirkkautta, ylväyttä ja sävyjen rikkautta. This CD release features the popular Symphonies Nos. 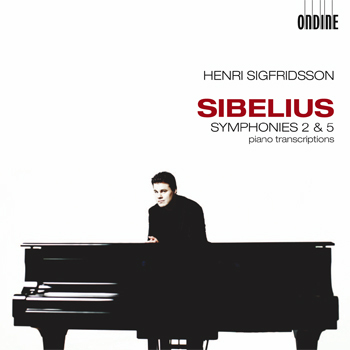 2 and 5 by Jean Sibelius, performed by Finnish pianist Henri Sigfridsson on piano. Ever since its triumphant premiere, the Second Symphony has been one of Sibelius's most frequently performed works; of his symphonies, only the Fifth comes close in popularity. The works' grandiose Romanticism is brought into sharp highlight in these transcriptions for piano solo. Henri Sigfridsson has used the Sibelius-sanctioned arrangement of the Fifth Symphony by Karl Ekman as a basis for his own adaptation of the Second Symphony. Following in the tradition of Liszt's Beethoven transcriptions, these arrangements are faithful to the original yet exploit the potential of the piano in many ways. Henri Sigfridsson has emerged as one of the major musical talents from Finland since he won the Beethoven International Piano Competition in Bonn in 2005. This is his first solo album for Ondine.